A few years ago, life was tough for Apo, 32, and her family. She grew fruit and vegetables on her small plot of land in Penyengat village, but a lack of equipment and skills meant that yields were low. Her monthly income ranged from IDR300,000-IDR500,000 (USD20-34). “Maybe because the land is not large and we were not focused, the result is not really much,” said Apo. Seeking improvement she joined the local Bina Tani farmer cooperative, which introduced Apo and other members of his village to the One Village One Commodity (OVOC) program, run by local pulp and paper company RAPP. The OVOC program works with villages to choose a suitable product to specialize in, then provides training on modern agricultural methods. Gading Sayoga, Community Development Coordinator at RAPP, said the OVOC program encourages each village to choose one product that is most suitable for that location. 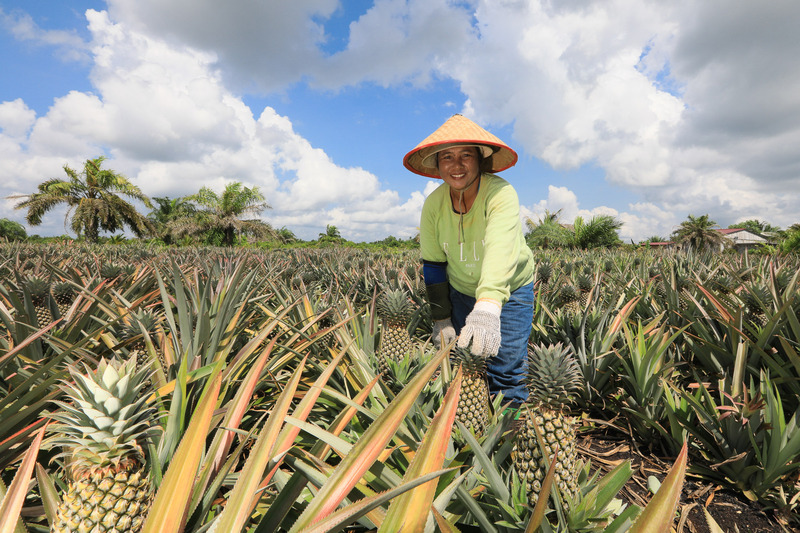 “As Penyengat village is suitable for pineapple, we all agreed this would be ideal for the community,” said Gading. With the crop selected the produce soon began to be marketed under the Penyengat Pineapple brand. OVOC operates in four districts of Riau Province. Other villages include West Kerinci, which produces crystal guava, and Lalang Kabung, which specializes in honey water apples. The program begins with training in how to grow the selected product, before modern equipment such as seeds, fertilisers and pesticides. The villagers also receive assistance in how best to market their products. In the case of Penyengat village, it was decided to divide the pineapples into two categories. Grade A sell for IDR5,500 each, while grade B are slightly cheaper at IDR3,500. In less than two years, the people of Penyengat village can already see the results. This program is a form of local community empowerment and supports government programs in improving people’s welfare through agriculture. Can Asia (and the UN) Hold Corporations Accountable?